The twenty year old is unlikely to feature for Manchester City in their game today at Chelsea after he was sent off in City’s Europa League exit on Thursday. He saw red for a horrible challenge that left the referee with little choice. After the game, manager Roberto Mancini was clearly cross with his £24 million player. Team-mate Nigel de Jong, himself no stranger to similar challenges, also spoke about Balotelli. Mancini was the manager at Inter who gave the young striker a first team place. He obviously believed he could handle him despite his volatile nature and discipline issues. After Mancini left, Balotelli never saw eye to eye with his replacement, Jose Mourinho, and the discipline issues started to increase. Balotelli appeared on Italian television wearing a Milan shirt, which understandably caused outrage and uproar amongst Inter fans. Then, when substituted in a game, Balotelli threw his Inter shirt to the ground when he was booed by his own fans. His time at Inter became untenable. 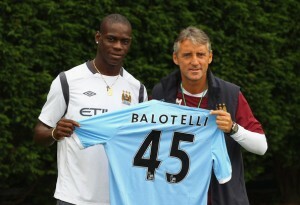 Mancini, now at Manchester City, went back to his old club and rescued the Ghanaian born Italian international. The transfer fee of £24 million was quite remarkable for a twenty year old who had played just fifty-nine first team league games over three seasons. Mancini is no mug and like many others, I expected to see a pretty special player. I haven’t seen that yet. What I have seen is a sulky, petulant, immature young man who is in danger of wasting whatever talent he has got. As Nigel de Jong said, Balotelli has got to learn by his mistakes. I hope he learns quickly, because if he doesn’t, it won’t matter how good he is, nobody will want to touch him.